Summary: In a world gone wrong, heroes and villains are not always easy to distinguish and every individual has the ability to contribute something powerful. 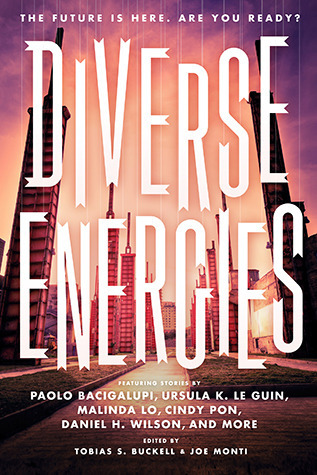 Review: I was excited to get my hands on Diverse Energies. Dystopia is an area of young adult literature that has been flourishing over the past few years especially following the release of The Hunger Games, but there is still a need for more works featuring protagonists from diverse backgrounds. To spell it out more clearly, it would be great to see more young adult dystopias with protagonists that are something other than straight white teens. With Diverse Energies, the editors and contributors were hoping to help fill this need and create change in the landscape of young adult science fiction. Before the stories begin, readers find a quote from John F. Kennedy: “The wave of the future is not the conquest of the world by a single dogmatic creed but the liberation of the diverse energies of free nations and free men.” This demonstrates the spirit of this book. There is a high value placed on diversity. The stories shared here reveal the strength and beauty of that diversity even in the midst of chaos. Dystopian stories typically have a corrupt entity taking unfair advantage of the masses often after war or another apocalyptic event. Since that is a fairly standard storyline, I was wondering how unique these short stories could be. It turns out that the voices were distinct and each one has a different storyline with its own particular flavor. There are stories of war, rebellious robots, child slavery, extreme economic disparity, time travel, among others. Most of the stories manage to end with a bit of hope, but like many dystopians, they are all pretty bleak so they do tug on emotions. In the very first story by Ellen Oh, the pain took me by surprise. I didn’t expect so much intensity right away. These authors meant business. The very next story, Freshee’s Frogurt by Daniel H. Wilson, is told in a lighter tone though the subject matter is also intense. I appreciated hearing the stories told in radically different ways. An anthology for me is like an appetizer sampler. The variety almost ensures that there will be something to appeal to everyone. Also, there isn’t such a large investment required of the reader when stories are so brief. I was happy to meet some new authors through this book and will be seeking out more of their works. Recommendation: Dystopian fans buy it now and even if you aren’t a dystopian fan, I would recommend you read it soon. The worlds and characters are rich and it is amazing to see what the authors have imagined into being within just a few pages.